Additional features: exterior hood, coated condenser coils, double-powdercoated case and exterior-grade power cord, thermostatic condensate heating element and 1/2" I.D. drain line. CellarPro's 3200VSx is designed to handle extreme environments and can be used for exterior through-the-wall wine cellar installations in environments up ranging from 20°F to 110°F degrees. The cooling unit also can be located remotely and ducted with our front duct kit, rear duct kit, bottle probe and remote control display accessories. For installations in environments as cold as -20°F, add the Fan Cycling Switch modification to your cooling unit order. 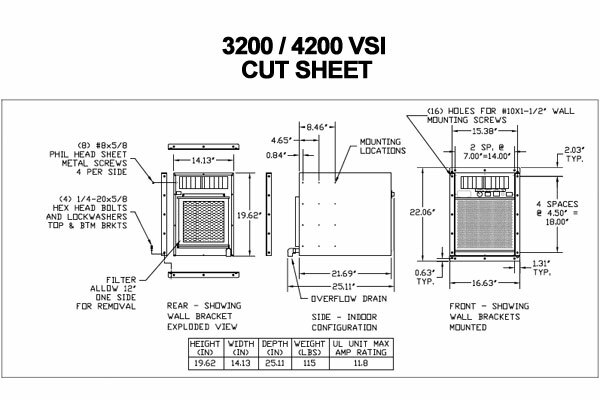 Please Note: The Aluminum Filter upgrade and the Crankcase Heater (for temperatures as low as 20°F) are automatically included with VSX units.